South Korea’s tech-heavy secondary bourse Kosdaq has been buoyed in recent weeks by foreign investors’ increased interest in the nation’s biotech and pharmaceutical sectors. 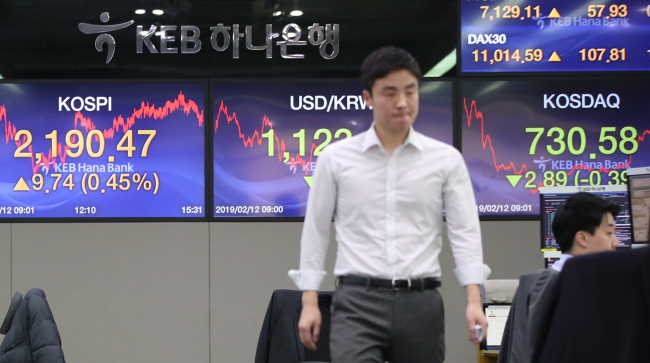 According to the nation’s sole stock exchange operator Korea Exchange on Wednesday, overseas investors’ net buying of local shares on the Kosdaq, from Jan. 23 to Monday, amounted to 490.5 billion won ($437.6 million), a stark contrast to their decision to net sell stocks worth 606.1 billion won last year. Industry watchers linked the buying spree to the latest surge in overseas investors’ interest in the nation’s main Kospi market, where 4.5 trillion won worth of stocks were purchased by foreign investors in January alone, their largest monthly net purchase in 45 months since April 2015. The Kosdaq rose 8.12 percent higher from the beginning of the year. Viromed, a biotech venture found two decades ago, topped the list, with foreign investors having scooped up 143.8 billion won worth of its shares, while Celltrion’s marketing and distribution arm Celltrion Healthcare followed with 54.1 billion won. Seoul Semiconductor, a light-emitting diode maker, ranked third with 32.3 billion won. “The high momentum of the buying spree by foreign investors in January, along with the fact that their focus is on big information technology companies, means offshore investors are seeking short-term profit -- the foreign buying spree on the Kosdaq is expected to continue for some time,” said Kim Sang-pyo, an analyst at Kiwoon Securities. Also, the subduing strong dollar trend is also contributing to lifted investor sentiment, analysts added. “Currency acts as a barometer for stress in the financial market, so a stable currency can create an investor-friendly mood for the Kosdaq market, where individual investors take up a large portion of the market share,” said Kim Hyung-ryeol, an analyst at Kyobo Securities.